Whenever you try sewing knits and stretching fabric for the first time, it can seem like a challenge. A little knowledge can go a long way so you can successfully sew knits and fabrics that stretch. Fabric is available in all different weaves and forms. A knit fabric is one that is made up of loops of fibers versus fibers that are woven horizontally and vertically or just fibers that are smashed together. Because of the loops, knit fabrics stretch. They might stretch from every direction or they might only stretch in one direction. You must know what the stretch is and how much stretch the fabric has in order to work with a pattern designed for knit fabrics. The information you need is on the pattern envelope. There is usually a graphic that will say X" of fabric must stretch to X". It also will state if the stretch needs to be one way or two way. You also must pay attention to the direction of the stretch in laying out pattern pieces. These are important factors in having the sewn item fit properly. Whenever you are sewing with a sewing machine, you should always allow the feed dog to feed the fabric under the sewing machine needle. It is very easy to pull at stretching fabric as it is being sewn and then you will see wavy or curled seams. Too much pressure on the presser foot also can cause the fabric to stretch even if you are allowing the feed dog to feed the fabric. Refer to your sewing machine manual to learn how to adjust the pressure on the presser foot. There are special edge treatments for stretching fabrics to create what is called a lettuce edge but that is not an effect you want on a seam. If you are experiencing skipped or poorly formed stitches as you sew, the culprit is probably the type of needle you are using. The name of the needle can change by the brand of the sewing machine needle, but the point of a sewing machine needle for sewing knits is usually called a ball point needle because it is not a sharp point and is designed to work with the loops that compose a knit fabric. Learning about types of sewing machine needles and sizes of sewing machine needles can save you many hours of frustration and assure you results that are what you want. 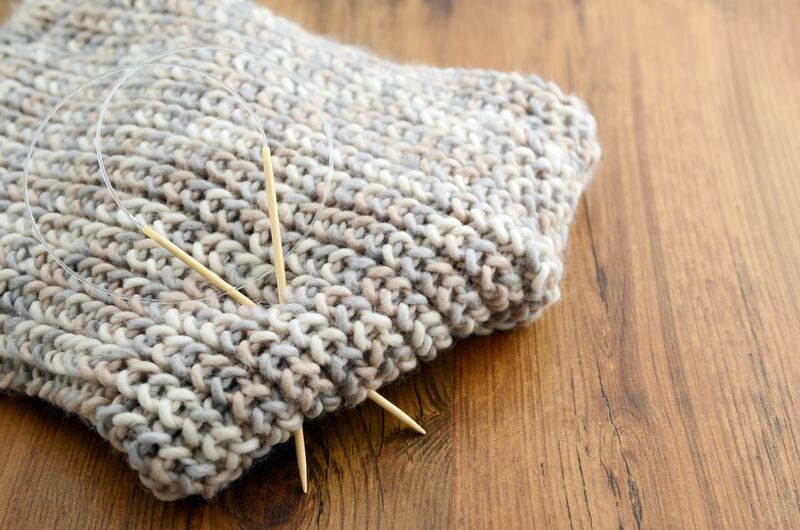 Basting, even with a long running stitch is a perfect solution to hold knit fabrics in place when you are sewing things like hems and fitting two pieces of fabric together. The basting holds the fabric in place and keeps it from twisting out of shape which can happen just because of the nature of stretchy ​fabric. Almost all sewing machines have some form of a stretch stitch. If your machine does only straight and zigzag stitches, it is possible to use the zigzag stitch as a stretch stitch. Use your scraps to experiment with a narrow zigzag stitch that will allow the fabric to stretch but still maintain a straight seam. If your sewing machine offers many stitch options, refer to your sewing machine manual to find the best stretch stitch options. It is well worth your time to learn about all the stitch options you have because many of the stitches can be used for more than one process. Many people would not give up their serger or overlock machine when they are sewing knits and stretchy fabric. Is a serger a machine you must have to sew knits? No. Is it a fantastic complement to sewing and are you going to love it if you sew a lot of knits? Most likely. Since you are the only one who can make a decision, you owe it to yourself to learn about sergers and all of the possibility before you make a decision. The beauty of knit fabric is the stretch but you don't always want the stretch. For example, you would want a shoulder seam to be a stable seam that does not stretch and end up down to your elbow. Many times you will find this type of seam stabilized with twill tape or lightweight interfacing that extends slightly beyond the seam allowance. Another important aspect of sewing knits is finishing all of your seams with a seam finish which stabilizes the seam and prevents the seam allowance from curling. As with all seam allowances, you want the seam allowance to lay smooth and blend into the garment rather than be a lumpy eyesore. Sewing Machines: What Is a Serger?